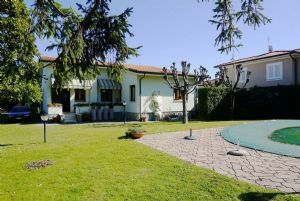 A detached villa with a lovely garden (1000 sq.m) located on a quiet street in the central area of ​​Forte dei Marmi, about 300 meters from the sea. 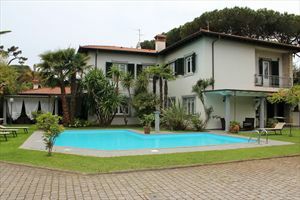 A detached villa (280 sq.m) with a lovely garden (1000 sq.m) located on a quiet street in the central area of Forte dei Marmi, about 300 meters from the sea. 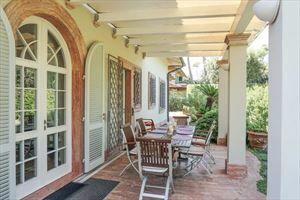 The ground floor comprises a living room with fireplace, dining room with access to the terrace with outdoor furniture, kitchen, bedroom with a single bed, bathroom with shower, closet. 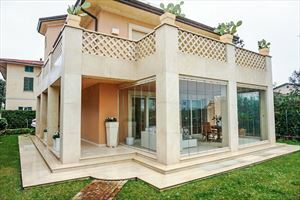 The upper floor consists of 1 double bedroom with private bathroom with shower; 2 bedrooms with twin beds, 1 double bedroom, bathroom with bathtub, bathroom with shower, walk-in closet. 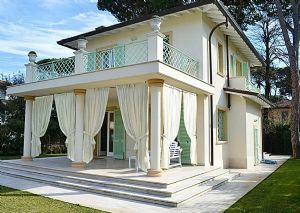 All the bedrooms have entrances to the terrace. On the ground floor are 2 utility rooms, WC. 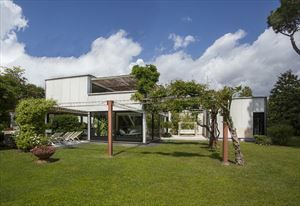 The property features a parking, barbecue area and summer terrace with dining table in the garden. 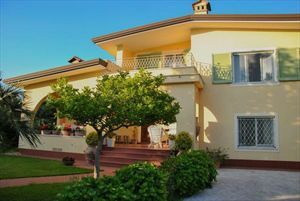 The villa is fitted with air conditioning in the bedrooms, alarm system, internet, safe, automatic gate.